Oh you know, I was sitting back the other day talkin’ about lentils with a couple of friends (true story). They were discussing the merits of french green lentils and black lentils but I think they were disrespecting the red lentil just a little bit. I don’t think you need to pick sides because lentils are delicious, whatever colour they happen to be. Red lentils turn soft and I think that’s why my friends were dissing it. Let’s celebrate that texture! It’s like a lentil hug that gives in, slides around, and gets all smooshy like the best kind of kiss. And you can’t pick a better lentil for a good old fashioned dal, right? This dal is full of broccoli. Chopped up, pulsed-in-a-processor broccoli (but if you’re got mad knife skills, feel free to use them) which is a bit of a trick if you’re serving this to someone who doesn’t like broccoli. Broccoli? What broccoli? Or if you’ve got cauliflower, whirl some of that up instead. The finely chopped broccoli melds well with the texture of the red lentils and the whole dish seems creamy and wholesome. Did I mention that it’s spicy? Because it is. You can tone down the spice using a mild spice blend and not adding in extra chilis, but that’s how I roll. But I also like a bit of sweetness to my spicy, so I added in some dates instead of honey or other sweetener. If you’re staying away from refined sugars, than you’ll love the natural sweetness that dates lend to the dish. I minced them up fine so that they blend easily into the dal. Lightly sweet, spicy and creamy while being totally vegan and healthy to boot? Yum. 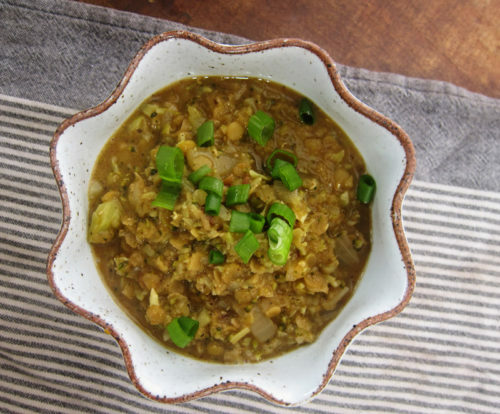 You can make this as soupy or stew-like, whatever you like best. Serve alongside rice, naan, or your favourite grain or eat it up plain like we did. It makes a lovely flavourful meal. Melt coconut oil in a large, deep skillet or your favorite soup pot. Add in onion and ginger and let things get soft over medium heat. Dollop in the curry paste and mix around before stirring in the red lentils. Once that gets a good shimmer and well mixed, stir in the vegetable stock, coconut milk and chopped dates and let that cook, covered for 15 minutes, adding water if the mixture becomes too dry. Meanwhile, chop your broccoli into large bits and throw the stalks first followed by the florets into a food processor. Pulse several times until you’ve got a minced mess of green bits. If you don’t have a food processor, put one on your wish list now! Or just chop the broccoli as finely as you can – think of it as a zen meditation process. 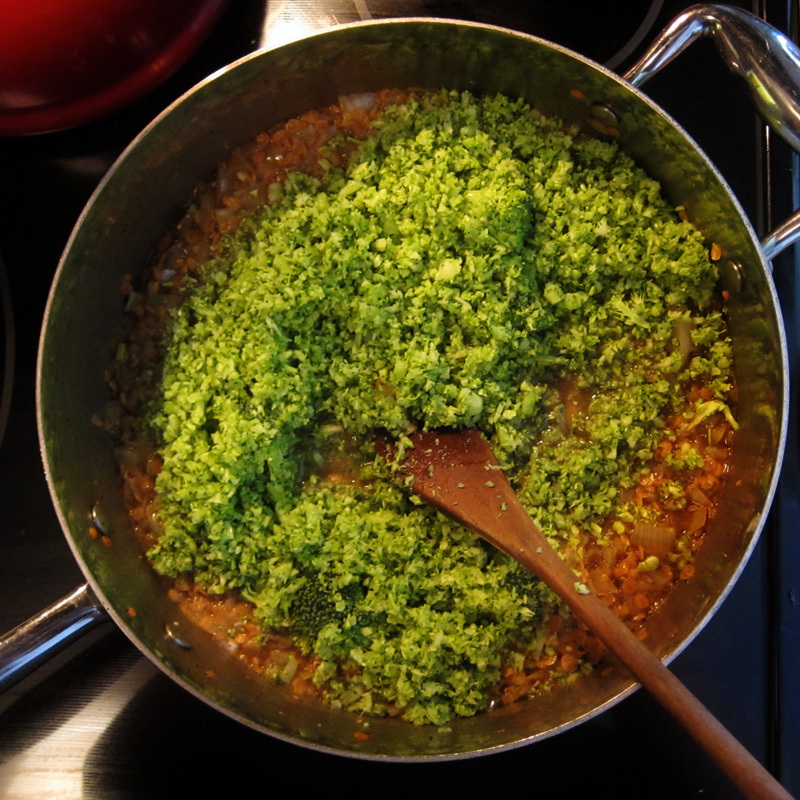 Dump minced broccoli into the lentils and stir, adding in the almond milk. Add in red pepper flakes, if you like your curry extra spicy (I do). Cover and cook for 15 minutes or until the broccoli becomes tender. Stir in some lemon juice, paprika and taste, adding salt if needed. 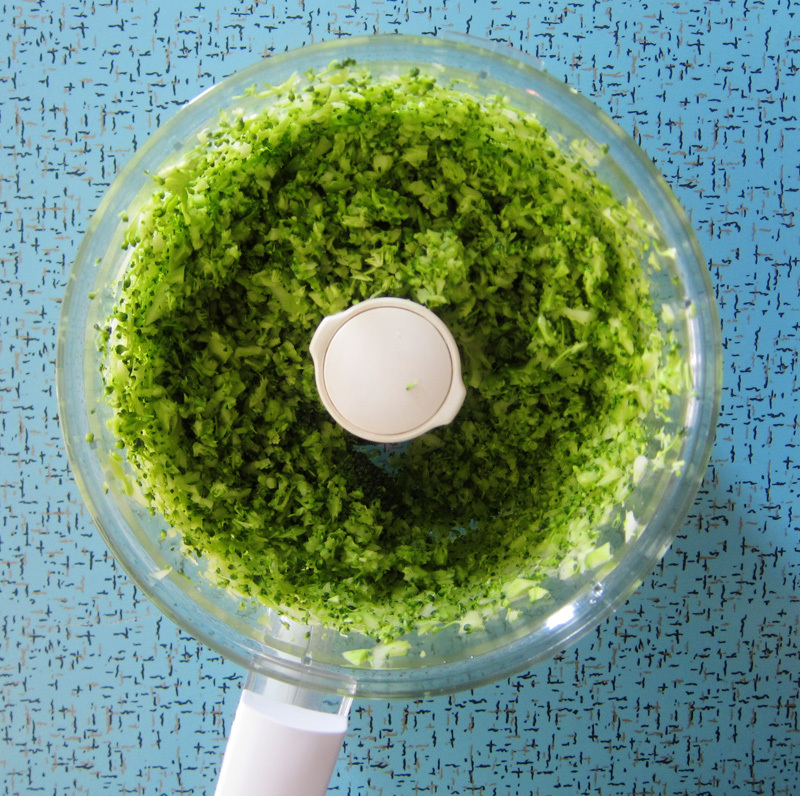 Serve in bowls with a scattering of sliced green onions or fresh parsley, if desired. Makes 3-4 servings. This sounds awesome!! What a fabulous idea! We love red lentils!!! It’s my 6 year old son’s favorite one..he calls it yellow daal. I’m always looking for new ways to cook it and I love how you’ve “hidden” some broccoli in it..the other ingredients sound different to be in daal (i.e. dates) but I’m sure it is fabulous and a must try! 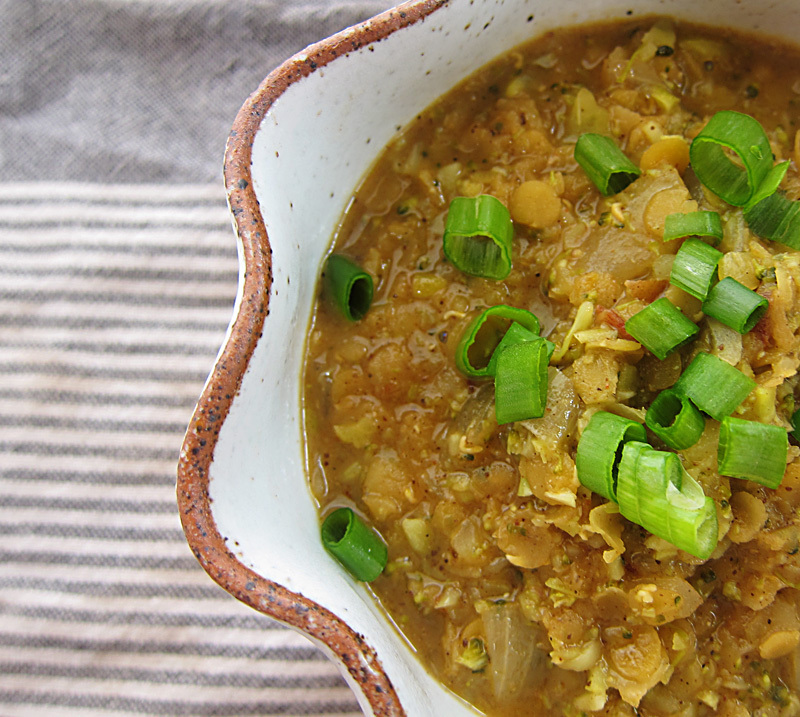 I actually think I love red lentils MORE because of their kind of mushy texture! I’ve been craving Indian flavors something fierce so this is going to have to go on the menu! Well this looks wonderful and comforting (something I surely new this week). Plus, I love all the lentils equally, so that works out well for me. :). Asiya, I’m not sure how traditional it is (okay, it’s not at all), but it all works! Cut down the spice levels and I’m sure your son would like this. Joanne, I know the feeling. I love them so much too especially for their texture. kickpleat, in lieu of sugar in a recipe, I take 5 or 6 dates, remove the seeds and add 3 tablespoons of hot, boiled water to a bowl. I soften the dates and mash them with a fork until a puree forms. Then I add it to the wet ingredients and continue with the recipe. I’ve tried it already with carrot cake and with muffins. It gives a lovely, moist texture to the crumb and isn’t cloyingly sweet. Plus, there’s fibre in dates. I haven’t tried the date puree in bread but I don’t see why it wouldn’t work. With the quick breads I’ve made lately, I have used a tablespoon (or two) of honey or maple syrup. Looks delish! Could I use normal milk or a light cream instead of the almond milk? I love lentils and this looks so delicious!! Sara, yes you can, but add it just before serving giving it enough time in the pan to heat up – any longer and I might be afraid of it curdling. Let me know how it goes! In the middle of making this, about to add the cauliflower instead of broccoli, but it doesn’t say when to add the coconut milk? Nice catch, Rachel! Add it with the stock. Recipe fixed, hope I didn’t screw you up! !